While most of the state enjoys warm water fishing, western NC boasts the highest point east of the Mississippi River (Mount Mitchell at 6,684 ft), part of the Great Smoky Mountains. 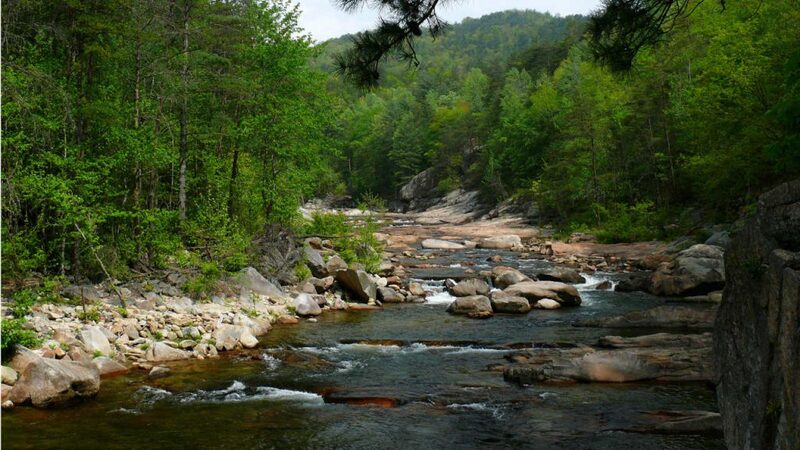 With watersheds that remain intact, protected as part of a National Park, some of the best back-country brook trout fishing in the east coast is to be found here. That said, trout habitat in Great Smoky National Park (which spans NC and TN) is under considerable stress. According to the NPS, there are 2,115 miles of streams in the park, but only about 800 miles hold trout, and only about 133 miles hold brook trout, all pretty much in headwaters streams above 3,000 foot elevation. Below 3,000 feet, most streams hold brown trout or rainbows that were originally introduced via stocking. As you get lower still, below about 2,000 feet, the cold water habitat turns to "cool water", and species like smallmouth bass predominate. While the watersheds are protected by the park, stress comes from a combination of acid rain and climactic warming. Since the 1980s, 6 populations of brook trout have been lost to increased acidity. Nevertheless, there are many streams in the park that support robust populations of wild trout. According to the Park Service's "fisheries facts" flyer, the top streams boast fish counts in the 2,000 to 6,000 per mile range, of which around 10% will be "legal" size for harvest (i.e. >7 inches). Most of the fish are small (under 9 inches) and fish larger than 12 inches are rare, with the exception of brown trout which turn piscivarious (they eat other fish).